Stravinsky's opera The Nightingale (Le Rossignol), is based on Hans Andersen's story of the Chinese Emperor who replaces a nightingale with a mechanical bird. When the Emperor falls ill, Death agrees to spare the Emperor if the nightingale will sing once more. Hockney's designs were highly stylized, set and costumes limited to shades of blue, black and white, reminiscent of the Chinoiserie Willow Pattern design. This costume is for the Bonze, a Buddhist monk, and the robe's very simplicity married to the high, stylized headdress help establish the character's authority. 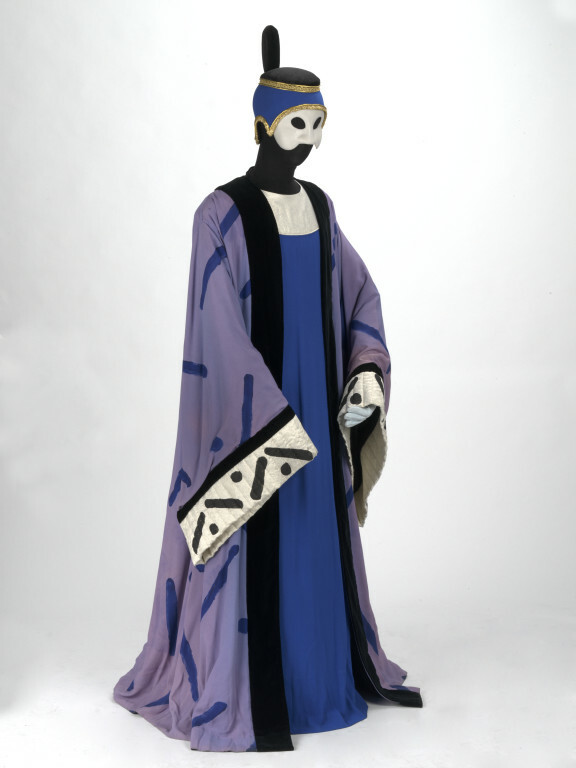 Costume for the Bonze in Stravinsky's opera The Nightingale (Le Rossignol), designed by David Hockney, Royal Opera, 1983, worn by Robert Lloyd. The production was originally seen at the Metropolitan Opera House in New York as a co-production with the Royal Opera. 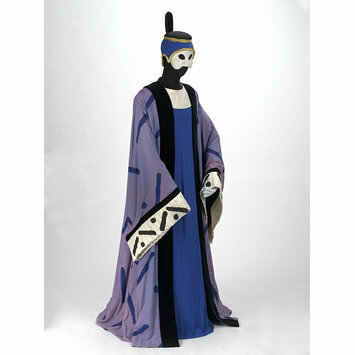 Historical significance: An example of costume designing by a distinguished painter. Hockney first designed opera for Glyndebourne in 1975 and went on to work on operas in Los Angeles and New York. Le Rossignol was performed in a double bill with Ravel's L'Enfant et les sortileges, also designed by Hockney, a co-production between the Royal Opera and the Metropolitan Opera, New York. This was the first Hockney-designed production seen at the Royal Opera House.